That quote is almost as old as quotes get about money. It’s actually a quote that the WSJ guys used in The Age of Cryptocurrency (pg 120). If you’re going all-in on a “new” currency idea, you gotta go all Roman-poet on people. Ex-CNBC-guys pumping it at literally every lower-high this year, most people haven’t been losing money during Bitcoin and Ethereum’s 2018 crashes. If you thought having your clients long Emerging Market currencies has been bad, try those alternatives. At a time and price (more interested in the economic timing as there really is no “fair market value” in our model for either the Brazilian Real or Lite-Coin), I’ll be excited to get long some of these things. That’s probably not happening anytime soon. Did I mention Brazil? The damndest thing happened as Darius Dale and I were going door-to-door meeting with Institutional Investors in New York City yesterday. 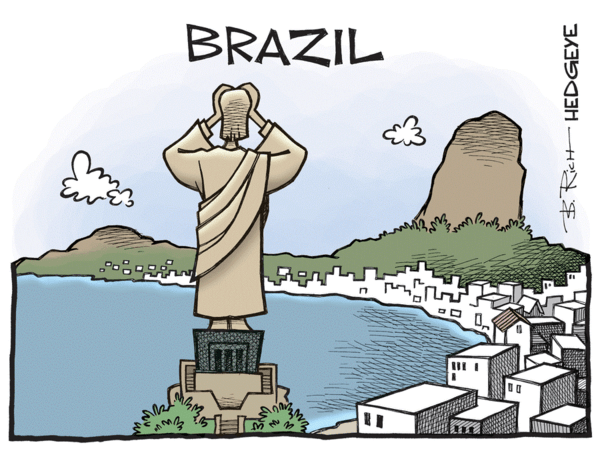 Some people were simply not happy that we remain bearish of Brazil. Amongst other things, if you’re looking at a multi-country (multi-factor) and multi-duration dashboard of rate of change risk this morning, you’ll note that the only major country 10yr Yield that is UP by more than a few beeps is Brazil’s. 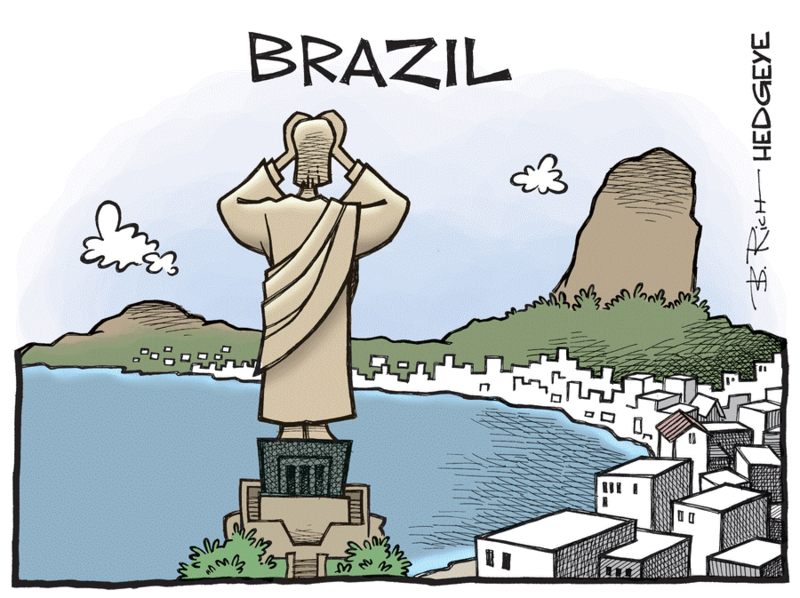 You see, Brazil’s 10yr Yield ramping +9 basis points (beeps) to 12.51% this morning isn’t a new @Hedgeye TREND. Brazil’s 10yr Yield is up +68 beeps in the last month alone and +266 beeps in the last year. Some hedge fund PMs can get mad at my forecast or stop losing money by understanding it. 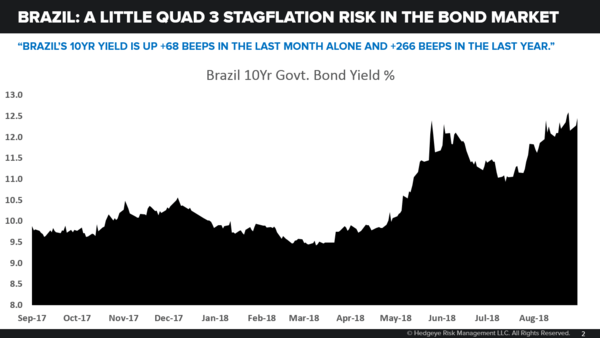 The high probability economic scenario in our Brazil GIP Model is that Brazil is in Quad 3 (stagflation) for 5 quarters (starting Q218) in a row. I get that people get upset when they are losing money. What I don’t get is some people getting so upset that they stop learning what made the people on the other side of the trade right. Rather than getting mad, why not get smarter? Imagine I walked into every meeting (and we do a lot of them!) just downright mad at dine-and-dash compensation cuts we’re getting from some “because of Mifid 2”? I don’t get mad. I just focus on innovating, taking share, and moving up the ranks. Remember, I was born and raised as a short-seller on the buy-side. Oh do I want to short Tech (haven’t done it in years!). But I don’t want to lose all my money shorting it at the wrong spot! What a difference a 1-2 day bounce makes in terms of risk re-pricing in futures and options terms: Tech’s (XLK) implied volatility PREMIUM just got smoked from +69% to +13%, in a day. So, we’ll see where the sellers come back first on #accelerating volume. USA vs. Brazil? I’m betting it’s Brazilian stocks and currency more so than in US stocks and US Dollars. We’ll see if that’s right. Across durations, my #1 goal in risk management remains not to be losing money when the crowd is. If more macro hedge funds had been short of EM, Brazil, and Bitcoin in 2018, some new client prospect meetings would be a lot happier!